St. Patrick’s Day. The holiday that gives you the excuse to wear green, drink green beer, try out your incredibly lame Irish accent, and brag about your very distant and possibly fabricated Irish lineage. As you’ve probably gathered from our Halloween posts, we love ourselves a goofy holiday at Pick Up Sticks. 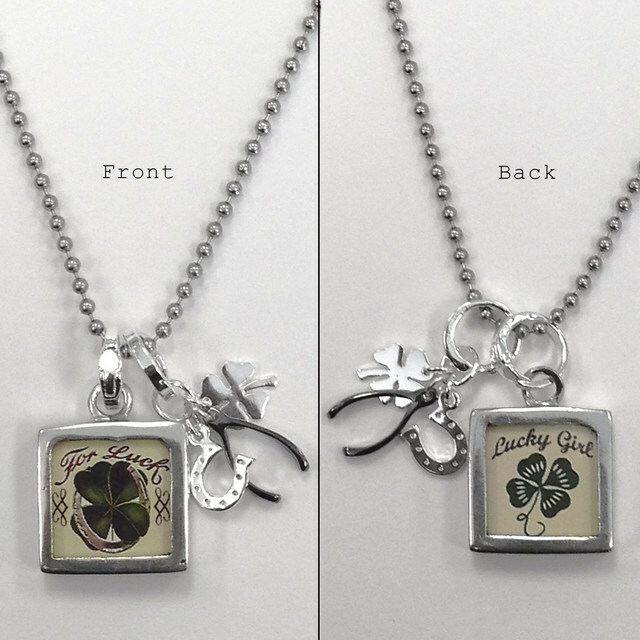 So much, in fact, that we design jewelry that commemorates the alleged luck that comes with being Irish and St. Paddy’s Day in general. And because of all that affection for green and the possibility of being pinched and luck in general, we decided a Facebook contest was in order. Did we say we also love a contest? Here’s the scoop – if you’re not already following us on Facebook, we’d be quite pleased to have you as a fan. Find our Facebook page here. Check out this week’s post on our contest. Share the post and then comment to let us know you’re shared it and you’re immediately in the running for the necklace shown here. We’ll randomly draw a winner’s name on March 4. So HURRY! Get your name in the proverbial (cyber) hat. Because we think luck isn’t just for the Irish and it isn’t just for St. Patrick’s Day. We figure you’re probably a Lucky Girl every single day of the year. And Lucky Girls need jewelry to show the world just how lucky they are. Plus, if green isn’t necessarily your color, this necklace will ward off all pinching on the day in question. Can’t wait to see you on Facebook. . .
D’Accord Boutique in Shepherdstown, WV (134 West German Street), was just one of the many Pick Up Sticks retailers who entered our display contest, but we found their bird house display one of the most unusual we’ve ever seen. We’re thrift store and flea market junkies at Pick Up Sticks, and we love the idea of using found items to create displays. “It was springtime, and we were enjoying an outdoor antique flea market. In one of the booths, a vintage wooden birdcage caught our eye. We began thinking of the Pick Up Sticks Display Contest, and thought it would be fun to display our charms in a birdcage. 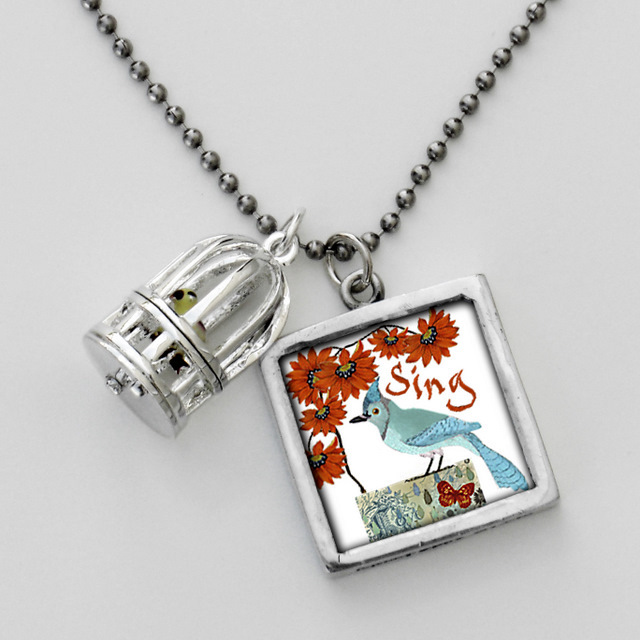 What a great way to display our bird-themed charms and trinkets. “Our customers often tell us of how much they enjoy our display. 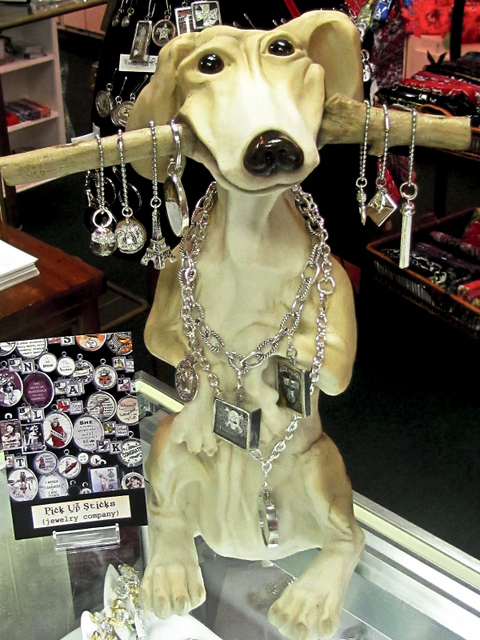 It is one of the first things you see upon entering our store, and sits atop a jewelry case. Several customers have told us that they love birds and birdcages, and that our display is what drew them into the store. Having our Pick Up Sticks display in a birdcage allows our customers to stop a while and peek inside before looking at our example necklaces in the jewelry case beneath. Or the bird necklace. . .
or join them on Facebook at http://www.facebook.com/DaccordBoutique. For those of you who are still searching for the perfect Pick Up Sticks display idea, feel free to use Debbie’s. 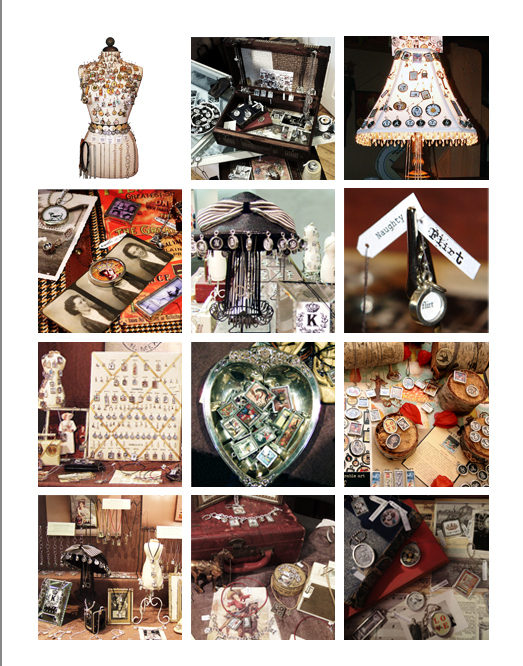 Or stay tuned – we’ll be sharing more ideas from our display contest entrants in the weeks to come. Our best advice: Do what Debbie did – keep your eyes peeled for great vintage finds at junk stores or flea markets (or in your grandmother’s barn. . .). 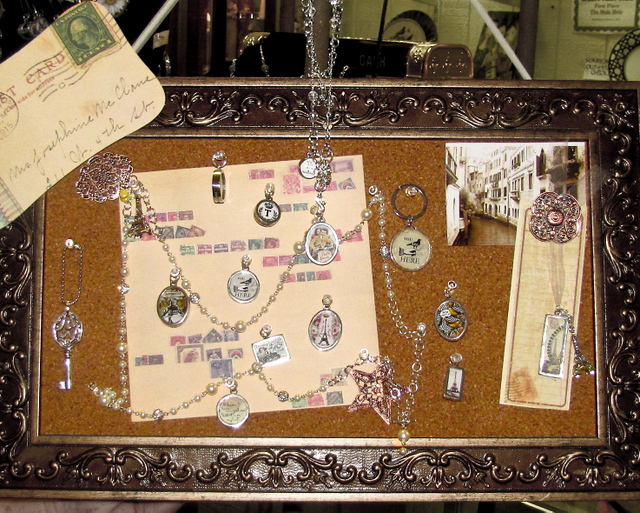 There’s no better way to display our vintage-themed charms. We thought holding a contest to find the best displays from Pick Up Sticks retailers would be great fun – give us some new ideas, show us how all of you out there do it. . .We just had no inkling how tough it would be to pick a winner. But we have, and we’re pleased to announce The Mole Hole of Somerset has taken the cake, set the standard, seized the prize! And won themselves $200 of wholesale jewelry by doing so. Are these displays great or what? We especially love the dog, which The Mole Hole calls Pick the Dog. Their story is that they found him waiting outside the front door one morning and decided to let him in for a while. He was so grateful that he chose to make himself useful, and has been displaying their Pick Up Sticks jewelry since day one. He makes us laugh out loud. . .
We agree. 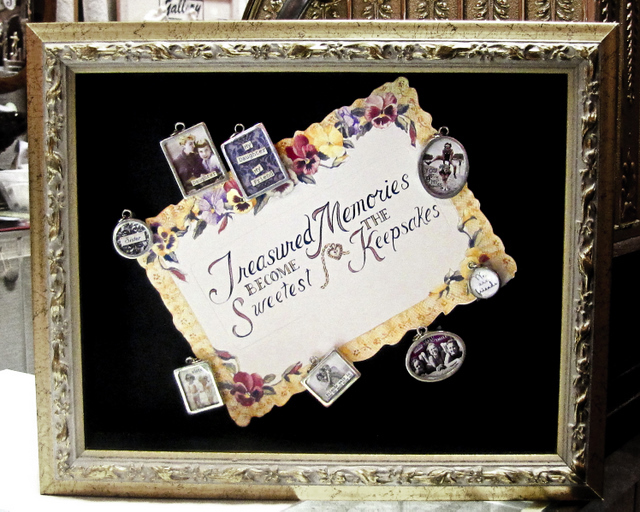 Using vintage materials to display Pick Up Sticks, and doing it in such an appealing way (hmmmm – a frame within a frame?) is a great way to sell jewelry. You make us proud, Mole Hole, and you’ve given us some great ideas so share with other retailers. By the way, you can find The Mole Hole at 370 S. Hwy 27 in Somerset, Kentucky, or follow them on facebook. Thanks to all of you who entered the contest – we posted the runners-up on Facebook, and may have space here to show you some of their amazing displays in the future. It really was a daunting task to choose the winner – we’re blown away by how creative ou retailers have been with their Pick Up Sticks displays. Can’t wait to see how you wow us next time! Every month we get the privilege of posting photos on our blog of our amazing retailers’ Pick Up Sticks displays – we’re continually amazed at the creative ways all of you find to promote our line. To celebrate your ingenuity AND to gather new ideas for all of us to share, we’re having a display contest from today through the end of May. And to make it worthwhile, the prize for first place will be $200 of wholesale jewelry! 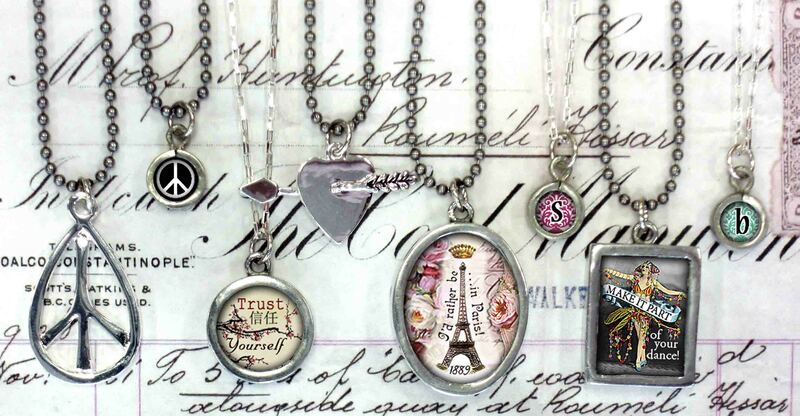 Second place will get $100 of jewelry and third will win $50 (wholesale price). Take a look around your retail space – if you already have a tested and true eye-catching Pick Up Sticks display, send a couple of photos to sabrina@pickupsticks.net. If you’ve been thinking about shaking things up in your store and totally changing your display, we’d love to see what you come up with in the next month. The staff, friends and family of Pick Up Sticks will help us decide which display is the most compelling, fun and attractive (since that’s what Pick Up Sticks is all about. . .)! If it’s too close to call, we may post three or four of the best display ideas on the blog and Facebook and let you help us choose. Who is eligible? All Pick Up Sticks retailers! But please understand, if you win, we can only ship your prizes to United States or Canada. You may enter as many display ideas as you want, before the deadline. So if you do a fun Easter display and then change it up for Mother’s Day or graduation, be sure to send us a photo of everything you try. What is eligible? Any photos of your Pick Up Sticks displays. Obviously photos must be submitted by the retailer to whom the display belongs. Don’t submit a display you’ve seen elsewhere in someone else’s store. What do I need to submit? Entries accepted via email only. High resolution images work best. Please email in a jpg format. You don’t have to purchase anything to win or participate. Internet access and valid e-mail address required. Void where prohibited. All entries must be received by June 18, 2011, 11:59 pm (MST) . Submissions must be the exclusive property of the entrant. You must have the unrestricted right to submit the display photo. You guarantee that the submission does not infringe upon any third party’s proprietary, copyright or other rights. You transfer to Pick Up Sticks all rights, title and interest in and to the display photos you submit. Pick Up Sticks will have the worldwide perpetual right to copy, display, reproduce, change, sell, assign, and market the photo of your display. Pick Up Sticks may register or otherwise use and exploit your display photo, in whole or in part, for any purpose, in any way and in any media without approval by or compensation to you or anyone else. If you’re not the winner of the competition, you still grant Pick Up Sticks the right to use any element of your display photo if they deem it appropriate for same. You grant Pick Up Sticks the worldwide, perpetual right to use your name as the designer of the display and the winner of this contest, without approval or compensation. You don’t have to purchase anything to win or participate. Internet access and valid e-mail address required. Void where prohibited. All entries must be received by June 18, 2011, 11:59 pm (MST). We’ve heard lots of great stories from Pick Up Sticks retailers and customers, but never one like this. So we had no choice but to choose Sylvie, the adorable, smart, hard-working 13-year-old from Summerville, South Carolina, who WORKS FOR PICK UP STICKS CHARMS. Yep, we said that right. Sylvie works for the sole purpose of adding to her Pick Up Sticks collection. When her employer, Heidi from On A Limb (onalimbflorals.com), e-mailed us with her story, we had to know more. So we called Heidi to get the low down on Sylvie. 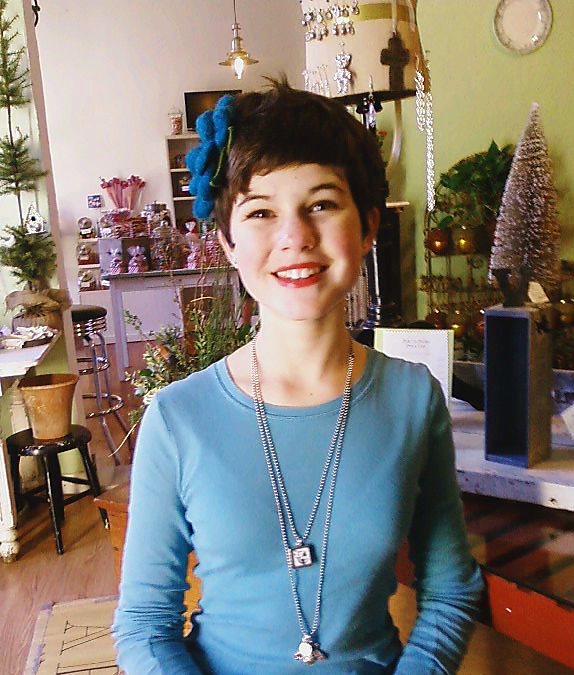 “Not your typical 13 year-old,” Heidi says, “in fact, like no other 13 year-old you’ve ever met.” Evidently Sylvie came into Heidi’s shop last spring, wanting to buy an expensive Mother’s Day gift for her Mom. When she saw the price tag, Sylvie asked if she could work to pay it off. Heidi put her to work scrubbing floral buckets, sweeping and taking out the trash. Heidi was leery of hiring someone so young, but Sylvie proved to be an amazing employee. And once the Mother’s Day gift was paid for, Sylvie asked to stay. Seems she’d had her eye on the Pick Up Sticks display. So now Sylvie, an accomplished drama student at a local fine arts school, works every Wednesday afternoon and Saturday morning solely to add to her Pick Up Sticks collection. 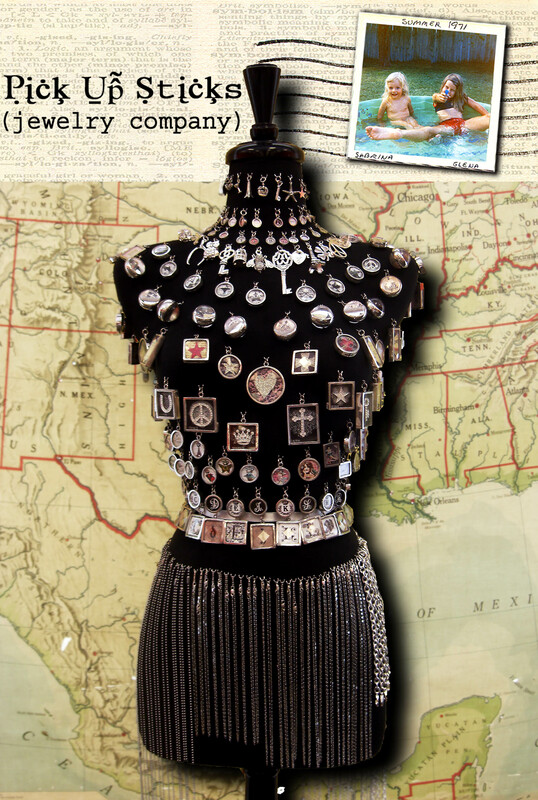 Her first necklace was given to her by her father – “All Who Wander” on a 20″ stainless chain. 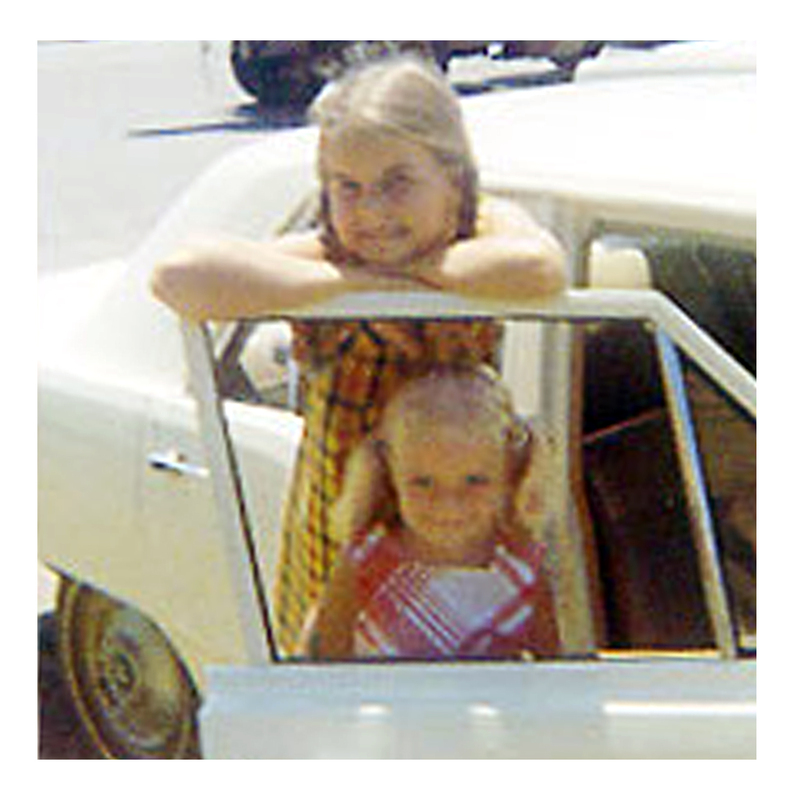 Her next necklace earned at the store was a 36″ stainless chain with a candy initial “S” and the bee trinket. Right now there’s a “Flaunt It” charm on Heidi’s bulletin board in the back of the store – Sylvie needs to work one more hour to earn that one. “Talk about great advertising,” Heidi tells us. Sylvie has graduated to running the candy store portion of On A Limb, and she brings all her girlfriends from school in to buy candy. Eventually they wander over to the Pick Up Sticks display. At Christmas, Heidi had great sales to the mothers of all those girls. It seems they all want what Sylvie has – a Pick Up Sticks collection. 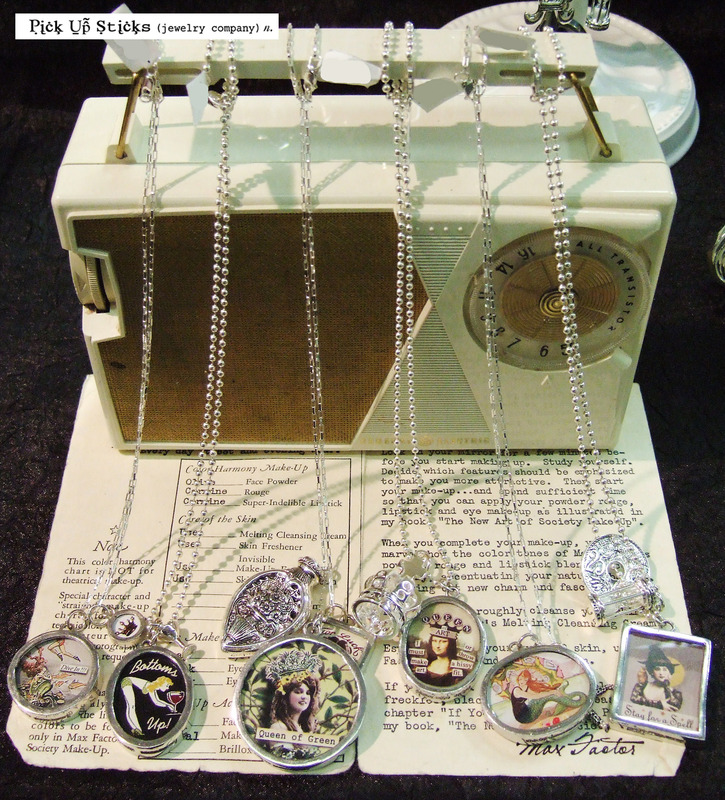 We’re proud that you chose our jewelry, and for your story, you’ll get to choose a 20″ stainless chain, a photo charm and a trinket. How’s that for expanding your collection? Find On a Limb Floral at www.onalimbflorals.com, or drop by at 120 Central Avenue in Summerville, SC 845-875-7056. Say hello to Sylvie for us! The Wild Child Has Arrived!! As usual, Sabrina has designed a charm that’s incredibly fun, but also true. And wouldn’t you know it, it’s also good-looking. Even better – she had help with this design. The image in this charm was the winner of our design contest. As you may recall, back on August 6 we published a post about our design contest winner, Deanna Hamsley. We told you then that Sabrina was tweaking the adorable photo that won the contest, and that someday soon we’d have a new charm to show you. Now that the charm has been designed and is ready to order, we wanted to tell you a little more about Deanna and that irresistible baby. Turns out it’s Deanna’s daughter, Emerson, who’s a Wild Child in her own right. According to Deanna, little Emerson Hamsley was a sassy baby and a total “ham” from the moment she was old enough to smile for the camera. She was a 7 month-old wild child in her high chair when her mama, looking for a photo of a sweet girl, pointed the camera and told her to say “cheese.” This image is what Deanna got from her girl. Emerson’s grandparents loved the photo so much they had an 8 X 10 made and put it near their dining room table. Emerson has thought all along the girl in the photo is her great friend – she talks to her when she eats at their table. Deanna decided this was the perfect photo to enter in the contest – a face to make anyone smile. Deanna loves Pick Up Sticks. She says she accosted a customer where she works when she saw the women wearing one of our necklaces. She picked up her first piece at Bella Vita in Collierville, TN, where she lives. 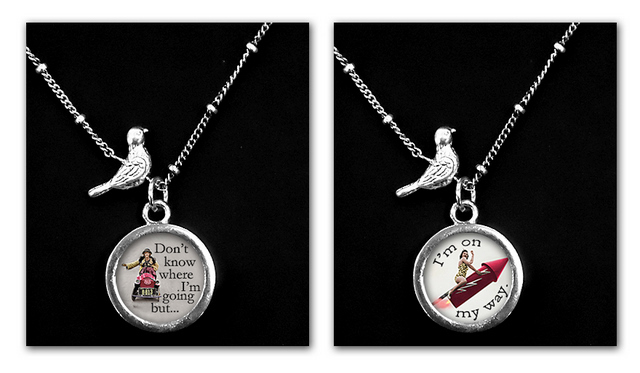 We asked Deanna about her favorite charms – she says she loves owls and owns the So Tweet charm. She also owns the Love Cake charm and a few initial charms, but the cake charm is her favorite. 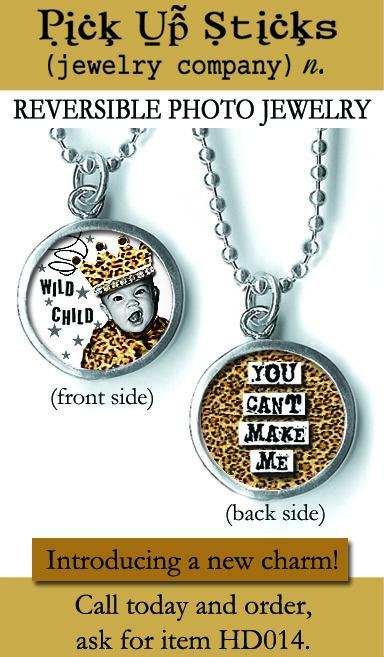 We’re betting that the new Wild Child charm may quickly become her favorite. This is what Pick Up Sticks is all about – creating charms that both reflect and speak to our lives, our friends, our families and our hearts. 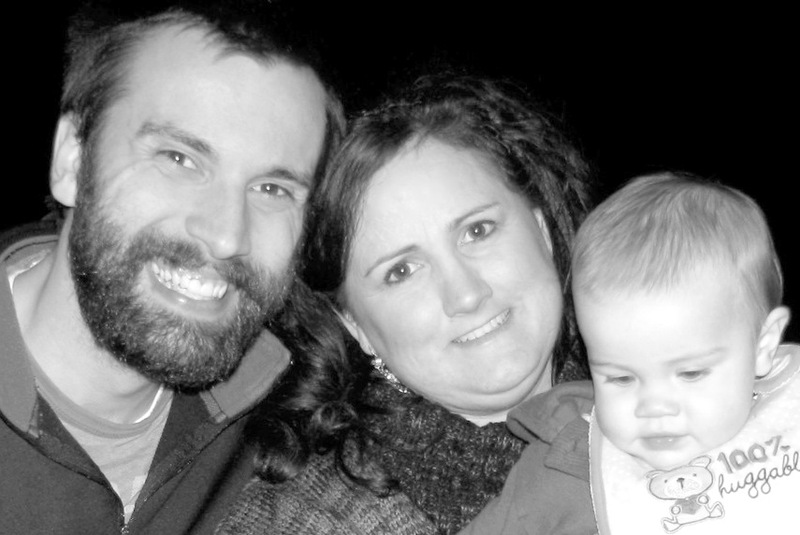 Thanks again, Deanna, for giving us your wild child’s smile and sharing her story! Design Contest – We Have a Winner! Wow! A big high five to all of you out there who took the time to submit an image idea for our design contest. 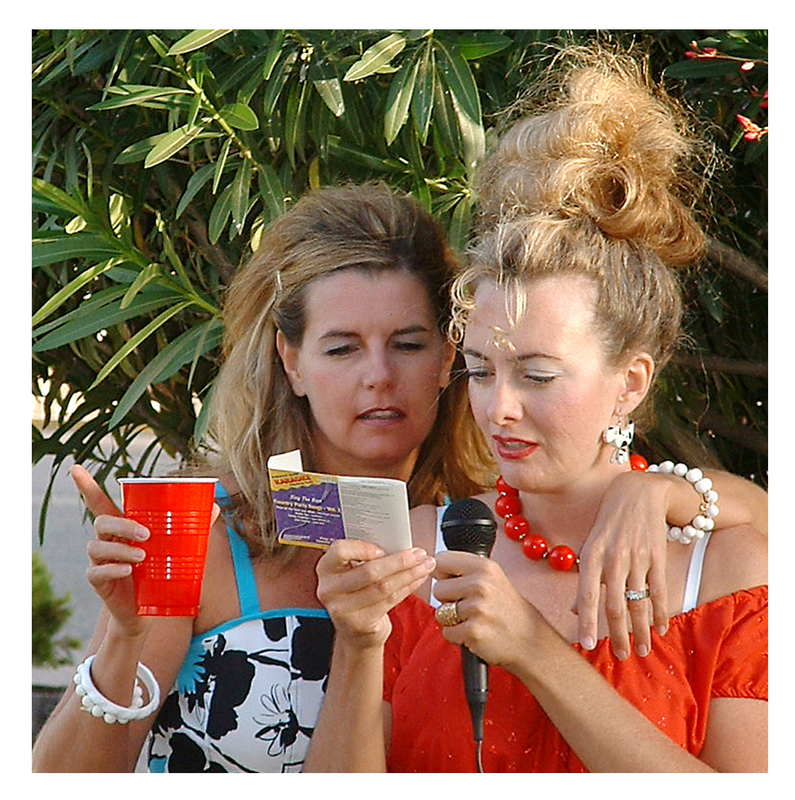 We had entries that made us do what we want YOU to do when you see our charms – grin, laugh out loud, sigh with recognition – all that stuff that makes a Pick Up Sticks charm a Pick Up Sticks charm. As we requested, you made us drool. Some designs were really funny and clever, some slightly irreverent (loved those! 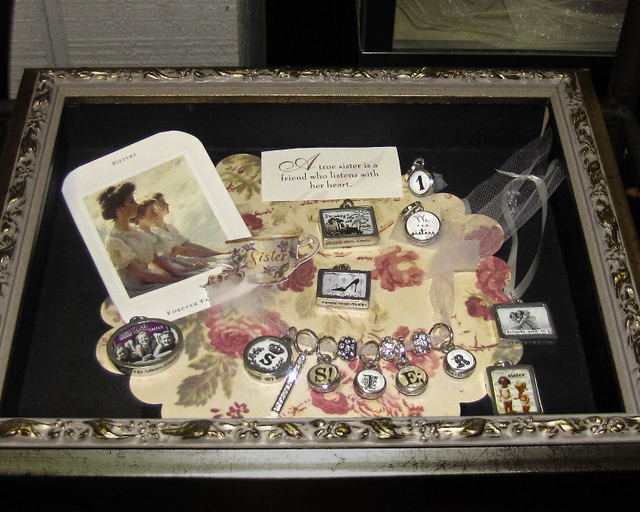 ), and some were so sweet our mamas would have been proud to see them on our display boards. But after two weeks of admiring and studying and being pleased with your enthusiasm and creativity, we had to narrow it down and pick a winner. Tough stuff, but we were determined to choose only one. As you know, our winner gets $100 in retail value of Pick Up Sticks jewelry (their choice), plus ten charms to give to family and friends. And the winner is. . . . . . . . . .Deanna Hamsley! We just couldn’t resist this sassy baby! We’re tweaking the quote to go with his irresistible grin, but that face! Is that the face that could launch a thousand ships (or at least a gut-busting guffaw or two)? Is this a face that will make you smile early in the morning when you’re donning your jewelry for a tough day at the office? We love this face. Congratulations Deanna, and to the rest of you, thanks for playing. Don’t let those creative urges rest – we’ll be doing this again sometime soon. Subscription Contest – Be Number 100! 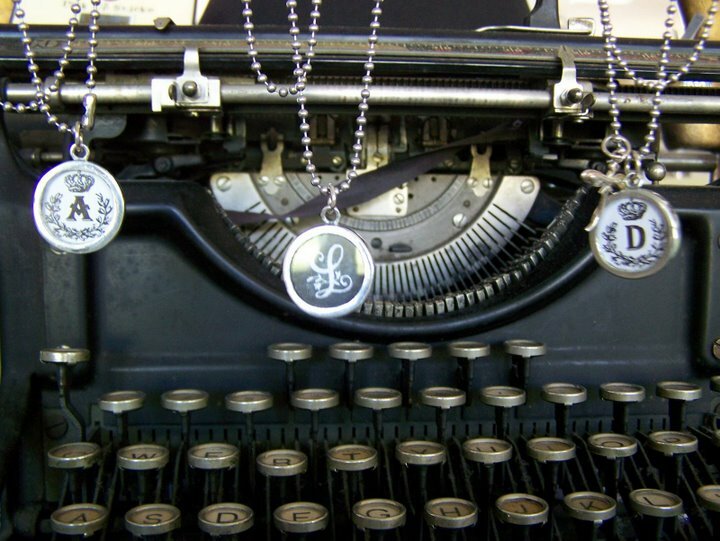 Like these charms? Choose them when you win our subscriber contest! As you all know, either from Facebook or from the retailer newsletter you received, we’re still waiting on a winner for the second half of our blog subscription contest. Number 50, Claudia Reyes Rios, was the lucky winner of a 20″ stainless ball chain with a photo charm and trinket of her choice. The 100th subscriber will get one photo charm, one word candy, and one trinket of their choice on any CHAIN of their choosing! You like sterling, you can have sterling. This is the perfect chance to win the Pick Up Sticks necklace of your dreams while subscribing to one of the funnest and most informative, interactive blogs in cyberspace. Did you miss this photo? Subscribe and never again miss postings of the goofiest pics of Glena and Sabrina. To all our retailers out there, feel free to print this post and let your most faithful Pick Up Sticks collectors know so that they can stay as informed as you are and maybe win a necklace in the process! Keep subscribing – We are sooooo close. You’ll want to subscribe – we have dozens of posts planned that will give you ALL the insider info on the Pick Up Sticks crew and everything that’s going on at the studio (how else are you going to get the scoop on Candace’s wedding plans?!). As we said before, we want you on our team, giving us feedback, comments, and telling us your stories. So, click on the subscriber button in the right-hand column, then be sure to check your e-mail for a confirmation and the link that insures you’re getting on our subscriber list. To thank you for becoming tuned in to the Pick Up Sticks blog, we’re going to give our 100th subscriber a prize. Good luck! This is so much fun for us. Hope you’re enjoying it as much as we are! 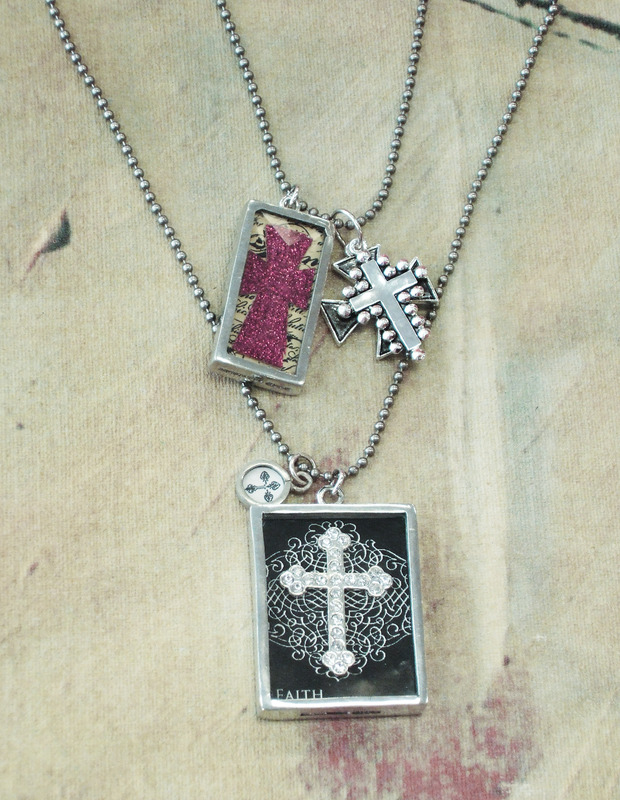 Pick a Necklace - You Could be Our Winner! For the three of you out there who aren’t on Facebook and just got lucky enough to locate our blog from our website or a search engine, we want to announce our newest Pick Up Sticks contest. Because we’re so proud of our blog, and because we have so many posts planned that will give you ALL the insider info on the Pick Up Sticks crew and everything that’s going on at the studio, we want you as a subscriber to our blog. Basically we want you on our team. We want your feedback, your comments, and we want to be able to find you when we have a really juicy story to tell (soon. . .very soon)! So, click on the subscriber button in the right-hand column, then be sure to check your e-mail for a confirmation and the link that insures you’re getting on our subscriber list. To thank you for becoming tuned in to the Pick Up Sticks blog, we’re going to give some lucky subscriber a prize. 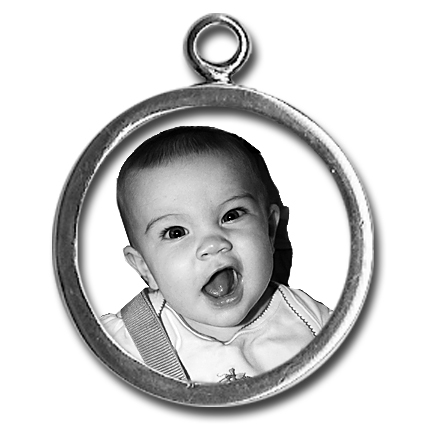 The 50th subscriber wins ANY photo charm and trinket their heart desires on a stainless ball chain. But that’s not all! 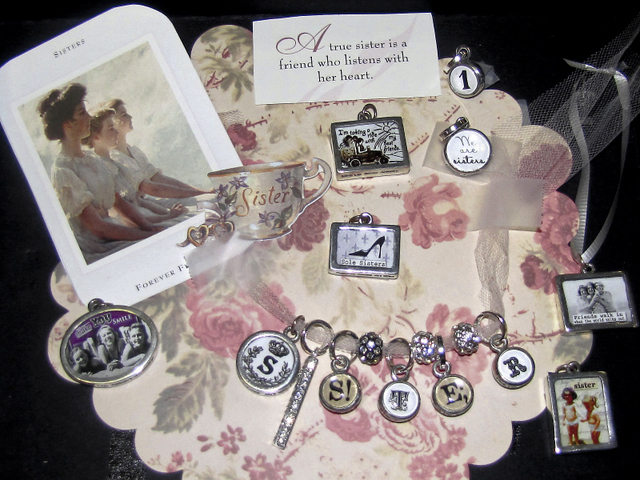 The 100th subscriber will get one photo charm, one word candy, and one trinket of their choice on any CHAIN of their choosing! It’s the perfect chance to win the Pick Up Sticks necklace of your dreams while subscribing to one of the funnest blogs in cyberspace. For all you retailers out there, feel free to print this post and let your most faithful Pick Up Sticks collectors know so that they can stay as informed as you are and maybe win a necklace in the process! Good luck! We LOVE being in touch with you guys.